The New York Times today cites an anonymous source who claims that the Getty Museum has agreed to return this 4th-century B.C. gold funerary wreath to Greece. A press conference has been scheduled at noon in Athens to announce the agreement. The Getty first acquired the wreath in 1993, but there has been a growing body of evidence presented to the institution that the wreath was unearthed by a farmer in 1990 near Serres, in Northern Greece, and entered the market through Switzerland and Germany. The agreement may also involve a 6th-century B.C. marble statue, which has also been claimed by Italy. As I’ve written earlier, the Getty has agreed to return 26 objects out of 52 claimed by Italy, after negotiations between the two broke down. The fact that both Italy and Greece are claiming the object cuts against both nation’s arguments, though it seems Italy has since abandoned its claim to the statue. Perhaps the Greek Culture Minister Georgios Voulgarakis’ address to the UN General Assembly, might have been planned to set the stage for today’s announcement. It might also indicate increasingly close ties between Greece and Italy. The Greeks seem to be adopting some of the more aggressive repatriation strategies employed by their neighbors. In the NYT, Voulgarakis has outlined an accord between Italy and Greece which would form a united cultural policy, and could even help the countries pursue claims jointly. The new Italian strategy employs prosecutions, public pressure, and bilateral agreements with transit states like Switzerland as well as market states like the US or UK. Interestingly, the headlines have been made, and repatriation has occurred not by using International Treaties, such as the 1970 UNESCO Convention, but by working with individual nations and employing existing domestic law. It’s not clear either how much today’s announcement will impact a potential prosecution of former Getty curator Marion True in Greece. She is currently on trial in Rome. It will be interesting to watch how successful this Greek/Italian cultural alliance will actually be. Public opinion seems to be favoring their position at this point, but Voulgarakis may want to be a bit more diplomatic about his public comments if he wants that to continue. In the NYT, he says that “…the Parthenon frieze has to be reunified, otherwise it has no historical value.” I can certainly appreciate the Greek desire to have the Parthenon sculptures returned, and they have a number of good claims, but the idea that they have no historical value hanging in the British Museum is simply preposterous, and does not strike me as a particularly useful way to conduct negotiations. I would like to know more about how this object was found. If it was a chance find, that might make for a slightly different situation than occurs when individuals simply dig into tombs or other cultural sites. Chance finds are a point of contention, as internationalists point out that restraints on alienation of cultural property do not satisfactorily deal with them. The AP is now reporting that the Getty Museum has indeed announced it will return the funerary wreath, along with the marble statue. An agreement has been reached in principle, but details have yet to be released. It’s still not clear whether the agreement will impact any potential criminal charges. The New York Times reports this morning that the Getty Museum has unilaterally decided to break off talks with the Italian Culture Ministry, and return 26 artifacts to Italy. Italy still wants the return of 27 other objects. 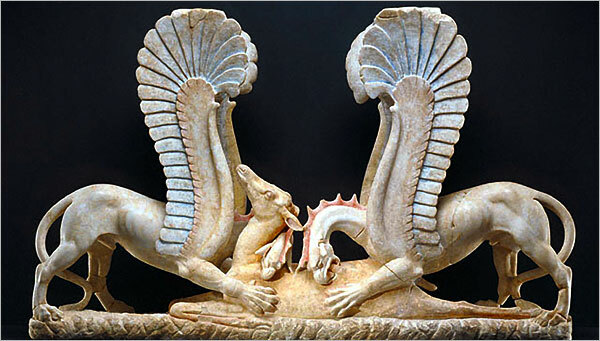 One of the works is this piece, “Table Support in the Shape of Griffins Attacking a Doe”, dating from the 4th Century BC. The background for these negotiations is the trial of former Getty Curator Marion True and art dealer Robert Hecht in Rome. If Italy is still unsatisfied with the Getty’s decision to repatriate only some of the antiquities, they may try to put pressure on Federal Prosecutors to bring charges against True in the US under the National Stolen Property Act (NSPA). Greek authorities have decided to follow their Italian counterparts, and have decided to bring charges against True as well, as reported by Reuters. This might be related to the Greek seizures on the Greek Islands known as the Small Cyclades, which took place in April of this year. I discussed them earlier here. Despite True’s resignation, her aggressive acquisition policy still seems to be causing problems for the Getty, the richest art institution in the world. Italy and Greece are attempting to send a powerful message with these trials: dealing in unprovenanced antiquities will not be tolerated. It remains to be seen though if a conviction will take place in either trial. Francesco Rutelli, Italy’s minister for Cultural Heritage, is apparently not pleased with the way negotiations have been going with the Getty museum regarding the return of a number of Italian antiquities, the LA Times reported last week. Giuseppe Proietti, a senior cultural official has said in a recent interview that “The negotiations haven’t made a single step forward…We will not accept partial solutions. I will suggest the Italian government take cultural sanctions against the Getty, suspending all cultural cooperation.” Apparently, such an embargo would have a limited effect, because Italy does not generally loan many objects anyway. A number of papers around the world have picked up this embargo story, including the Australian, and The Times. Its yet more evidence of Italy’s aggressive new strategy to repatriate its antiquities, and prevent their illicit excavation. Much of the tension here involves a debate between what John Henry Merryman has called cultural nationalists and cultural internationalists. Cultural nationalists generally believe that an object belongs in its context. So in this case, they would argue the Italian antiquities are best enjoyed and appreciated in Italy. On the other hand, Cultural Internationalists generally believe in an open and honorable antiquities market, which allows objects to be bought and sold. In that way, the market moves them to the location where they can best be preserved and studied. Both positions seem reasonable to me, however they are mutually exclusive, and lead to a great deal of contention, mainly between dealers and archaeologists. 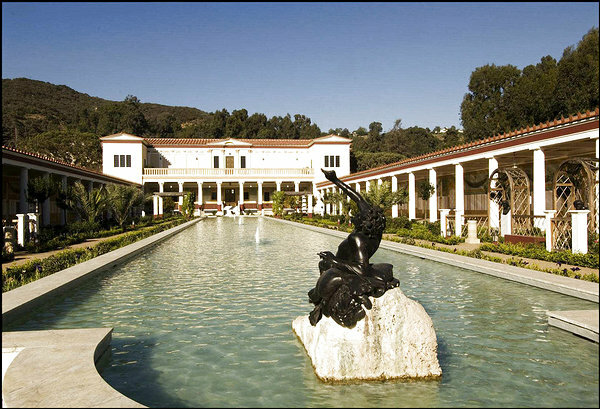 The image here is of the new $275 million restoration of the Getty Villa in Malibu, which houses Etruscan, Greek, and Roman antiquities (including many of the objects Italy wants returned). It was patterned after the first-century Roman Villa dei Papiri, which was covered after the eruption of Mt. Vesuvius, and recently redesigned by Jorge Silvetti. I don’t think anyone can argue that this new renovated Villa is not a fantastic venue to exhibit these works. However, does Italy have a stronger claim to them, especially when some of the most valuable antiquities seem very likely to have been looted? The archaeological context surrounding these objects may have told us a great deal. However that contextual information is now lost forever. Dr. Lorenzo Zucca highlights an interesting piece in yesterday’s New York Review of Books, which helps shed some light on the dispute. The Getty, established in 1953 by J. Paul Getty is one the wealthiest art institution on the planet, boasting assets of $9 billion. In the 1980’s, the Getty pursued a very aggressive antiquities acquisition policy. This has led to the indictment and trial of Marion True, a respected curator of Greek and Roman Art. Italy certainly aims to make an example out of true, and the dealer who is also on trial, Robert Hecht. The California attorney general has also recently concluded an investigation. It is hard to predict the possible outcome of the negotiations between Italy and the Getty. Italian authorities are certainly elevating the rhetoric in an attempt to shame the Getty into repatriating many of its works. We can debate whether these objects belong in Italy or in Malibu until we are blue in the face. The fact remains, though, that wherever these pieces are, people will come to visit them. Yesterday’s New York Times has an interesting article regarding Italy’s negotiations with the Getty museum for the return of Italian antiquities. One of the objects at issue is this 5th Century B.C. 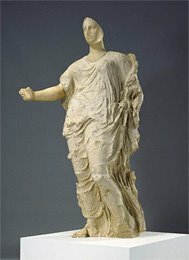 limestone statue of Aphrodite which the Getty acquired in 1988. The negotiations are part of an aggressive strategy Italy seems to be implementing with respect to policing and repatriating its antiquities. The so-called Getty trial is currently underway in Rome, and Italy also recently signed an agreement with Switzerland, one of the traditional transit states for Italian antiquities. People close to the negotiations, speaking on condition of anonymity out of concern that their remarks could arouse personal antagonism and jeopardize the talks, say the Getty has made it clear that it is prepared to return about two dozen objects on the list. If the items were in fact illicitly excavated, Italy may be able to get the Getty to return at least some of the objects, as it’s really bad publicity for the Getty overall. I’m just speculating here, but they may want to wait until the conclusion of the trial before they return the objects, and that’s when I would expect a deal to emerge (much in the same way a President may boot an unpopular Secretary of Defense). We should remember, though, that much of the damage has already been done. When this statue was excavated, it was embedded in a wealth of archaeological information, what is often referred to as context. When this object was dug up, that context was almost certainly destroyed. Also, the Getty didn’t excavate these objects, though they did pay a substantial sum for them. Italy’s argument is that these funds support the illicit excavators and unscrupulous dealers, so this kind of transaction should be reversed, to prevent future destruction. This is a tenuous disincentive though, and one of the reasons why tackling the illicit trade in cultural property is so difficult. At this point, the Italy-Getty negotiations seem very similar to the Greece-British Museum arguments regarding the Parthenon Marbles. However there is one marked difference: this sale only occurred within the last 20 years, while the Parthenon Marbles have been in Britain for closer to 200 years. Agenzia Giornalistica Italia reported on Nov. 6 that 12 arrest warrants were issued, and 10 arrests were carried out for art theft and kidnapping. 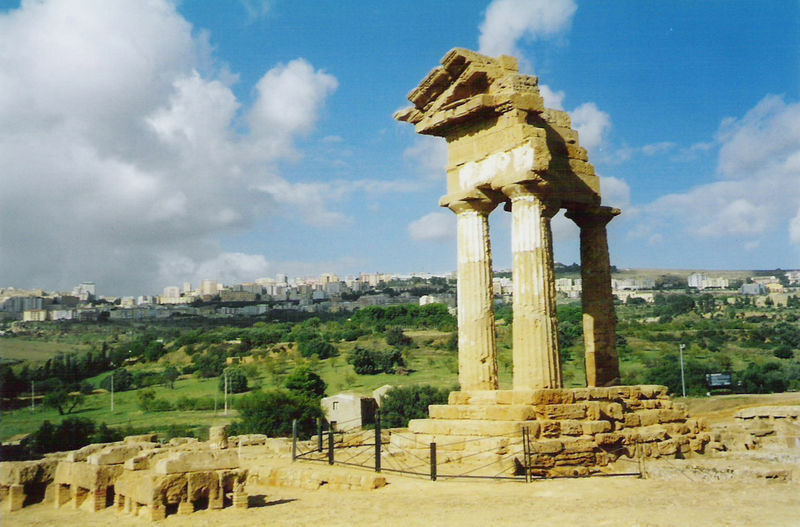 The arrests occurred in Agrigento, on the island of Sicily. The island, of course, is notorious for its beautiful Greek and Roman heritage, and also for its ties to organized crime. The image is of the temple of Dioscurio, located near Agrigento. The city is one of the poorest in Italy, despite its incredibly rich archaeological heritage. This may be an example of the Italian authorities cracking down on illicit excavation. I haven’t been able to find any more information on the arrests, but when I do, I’ll post it here. A new art exhibit in Rome will display 100 works of art that the Italian Art Squad, the Carabinieri Cultural Heritage Protect Unit, have recovered in recent years. The exhibition will take place at the Palazzo Incontro, (Meeting Palace). It is often said that if we could gather all of the stolen works of art into one museum, it would be the world’s finest collection of art. That claim is of course quite far-fetched and nearly impossible to quantify, but perhaps this exhibition will illustrate how much art is being lost. 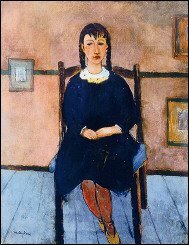 The exhibition, titled “Stolen art, the return” includes Young girl with red stockings by Amedeo Modigliane (pictured here) which was stolen from its private owner in the 1990’s, and has never been publicly displayed. Other works include two paintings by Francesco Barbieri, known as il Guercino. Also, an artifact called the “Ivory Face” uses a technique called chryselephantine which combines Ivory and Gold. Its age and provenance are unknown however, illustrating how much context can be lost when illicit excavation takes place. The exhibition is quite remarkable, and a very shrewd move by the art squad. It is a very tangible expression of how many works are being lost, and how a well-funded and committed police force can limit the illicit trade in these works. The New York Times devoted a short brief on the so-called Getty trial wednesday. After a long summer hiatus, the trial of former Getty Museum curator Marion True and art dealer Robert Hecht continued Wednesday in Rome, with the testimony of Fausto Guarnieri, who once worked for Italy’s art-theft squad. The statue is only on e of the objects at issue in the prosecution of True and Hecht, who are accused of dealing in stolen artifacts. A 1939 Italian law vests title to all unearthed antiquities in the State. 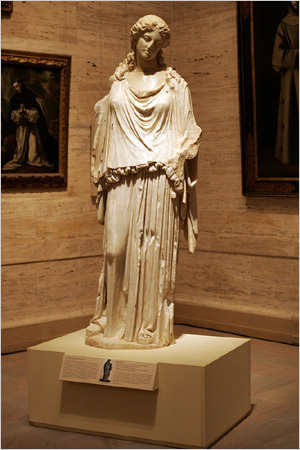 The statue of Aphrodite, pictured here, was purchased for $18 million by the Getty in 1988. It dates from the 5th century BC, near a Greek settlement in Sicily known as Venere di Morgantina. 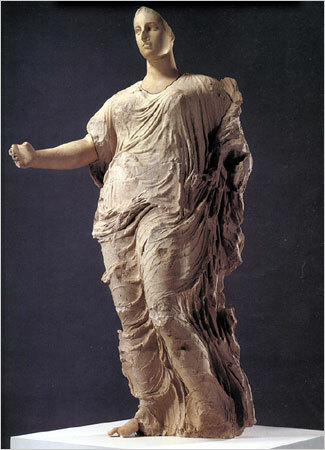 Italian authorities were alerted in 1986 by rival looters, who were angry that the statue had been sold too cheaply. Guarnieri testified that 20 years ago tomb robbers led him to a site in Sicily where the statue had been unearthed. The trial is a tremendous black eye for the Getty, as the sculpture is a centerpiece of the museum’s antiquities collection in Malibu. True’s defense counsel are arguing that the sale of the statue was met with little official interest by Italian authorities in 1988 when the sale took place. Apparently, the statue was not on the official list of stolen objects when the Getty made official inquiries at the time of the sale. It would have been difficult though, as there was no record of what the statue actually looked like. Prosecutors are relying on scientific data which points to the statue’s origin in Morgantina. This trial will of course be watched very closely by museums all over the world with Italian antiquities. Though I failed to grasp it when I posted comments about the decision by the Museum of Fine arts in Boston’s decision to return 13 antiquities to Italy, the True prosecution may have been at least part of the impetus behind the decision. Also, New York’s Metropolitan Museum of Art recently returned 21 pieces to Italy. I’m not sure what this prosecution means for the illicit trade. Certainly, it seems likely that museums will be far more careful when they acquire Italian antiquities. However, it seems likely that the looters will continue their work, they just will sell to dealers and individuals rather than museums. Is the public good being served by having these objects in the hands of an individual rather than a museum? Perhaps not; but however nefarious we might believe the actions of True and Hecht were in this case, wasn’t there a tremendous value in allowing the public to view these objects? Its the same kind of argument that Greece and the British Museum have been fighting over for centuries in relation to the Parthenon Sculptures/Elgin Marbles. There are no clear answers. However, the Parthenon Sculptures have been resting in London for centuries now, while the Italian antiquites are a fairly recent acquisition by the Getty. Conversely, the archaeological context was lost when the statue was unearthed twenty years ago. However, was there anything in that soil record about Greek civilization that we don’t already know? We can’t be sure. At the very least, the idea of a museum acquiring a very valuable object which had been looted strikes me as distasteful. It certainly reveals a troubling part of museum acquisition which I suspect the vast majority of visitors are unaware of. What is certain, is that Italian authorities are pursuing an aggressive policy of pursuing antiquities found/looted/unearthed within its borders. This will likely diminish the prices which sellers of certain questionable objects can expect to receive for their finds in the short-term. But it might increase the price which may be paid for objects with a clean provenance. An unintended consequence may be the decrease in opportunities for visitors and residents California, Boston, and New York to see these examples of Greek and Roman culture. Perhaps the way forward is an increase in travelling exhibitions, but there are financial, logistical and other drawbacks to that remedy as well. The one thing all parties involved in this prosecution, and the wider debate can certainly agree on, is that these are extremely valuable and beautiful objects.